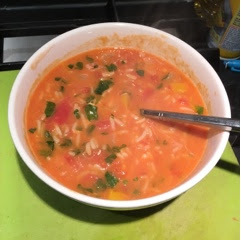 This is a delicious soup, just lightly spicy and very filling. In a large saucepan heat the oil over low heat. Add the onion, bell pepper, garlic and cook stirring occasionally until the onion and pepper are soft. Add the rice, chilli flakes, salt, tomatoes and water to the pot and bring a boil. Cook until the rice is almost done, about 10 mins. Stir in the coconut milk. Bring to a simmer and then add the prawns. Simmer, stirring occasionally, until the prawns are just done, 3 to 5 mins. Stir in the black pepper, lemon juice, and parsley and serve.